Williams Allegro 2 Review - Is this review worth a look? If you are reading this it is because you are in the market for a new piano. When buying an electric keyboard there is a big premium on good information. That is why we made every effort possible to bring you the best Williams Allegro 2 review possible. We have tested this instrument front and back to ensure that no critical detail was missed. Then, we assembled our findings in this handy guide. If you want to make the most informed buying decision possible, you know what to do. Read on for our comprehensive review of the Williams Allegro 2! Let’s now take a look at a few important features that will help you to make the best buying decision possible. The bottom line is that if a keyboard does not have weighted keys, you aren’t going to want it. Why? Weighted keys are what make electric keyboards feel like acoustics. If you are new to the world of piano, you may not even realize why that matters. After all, you are in the market for an electric keyboard, right? So why should it feel like an acoustic? There are a couple of reasons that you are going to want weighted keys. For one thing, a weighted keyboard is going to play a little bit smoother than unweighted keys. 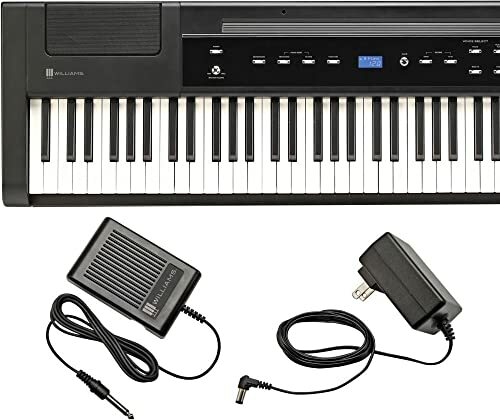 A weighted keyboard is also going to help you to easily transition to acoustic should the need present itself. If you take piano seriously, the ability to seamlessly transition to an acoustic isn’t optional. A weighted keyboard is pretty much all it takes to make an electric feel like an acoustic. All of these things in mind, it is definitely nice to see that the Williams Allegro is fully weighted. All eighty-eight keys are designed to feel like the keyboard of an acoustic. Now, that said there is a small issue with the keyboard. The keys are weighted, but they are not graded. This means that each key plays pretty much exactly the same way. Why does this matter? While it may not be extremely impactful in the long run, it is slightly different than the experience you will have with an acoustic. Acoustic keys are weighted slightly differently insofar as the fact that lower notes weigh more than higher notes. Even with this said though, most people won’t have any problem with the Williams Allegro 2. One of the nice things about getting an electric keyboard is that they usually come with a variety of different sound options. You definitely get that here. The Williams Allegro 2 comes with ten different sound options. While there are keyboards out there that come with more tones, this will still be enough to leave you with ample options. The tones range from synth options, all the way to grand piano sounds. With ten choices, everyone should be able to find something that they like. In addition to tone options, another benefit of the keyboard is that it makes recording music quite simple. Indeed, you do get solid digital recording options with this keyboard. The Williams Allegro can easily be hooked up to your computer through USB ports to make recording your play as straightforward as possible. From that point, you can easily edit and alter your songs on the computer as needed. Last but certainly not least, the Williams Allegro 2 features an easy to use interface that should be suitable for people of every skill level. Electric keyboards are sometimes known for getting a little bit overly complicated so this good to see. The controls are limited to a few buttons and nobs so most people should have no trouble at all sticking to the settings that they are comfortable with. Granted, the ease of this interface stems partially from the fact that this is a fairly basic piano. However, even with that said, it is still nice to have a control panel that can be easily understood. There aren’t a lot of issues to speak of regarding the Allegro. It is a good piano and when you accept the fact that it is on the basic side, there is not a lot to complain about. One thing that you will want to keep in mind is that this unit does not come with a stand. Given the size of the keyboard, you can probably comfortably play it on a dining table. There are also issues pertaining to performance that you will want to keep in mind. The biggest performance issue that we noticed was that the sound quality is a little bit iffy. The beginner probably is not going to notice or mind. However, if you have a little bit of experience to your name, you are probably going to want to find something with a little bit more quality. This aside it is a good piano that will be suitable for most beginners. Now that you have learned everything that there is to know about the Williams Allegro 2, let’s summarize the findings of the review as we look at some pros and cons. Read on! The Williams Allegro 2 has plenty going for it. Though simple, this affordable keyboard capitalizes on a range of high-quality features that give it an edge over the other options in its price range. If you are looking for an affordable keyboard that excels in the departments that matter, this is one to think about. Is this piano a little on the basic side? Yes. However, for many people that won’t be a problem. If you are a beginner, or even just someone that doesn’t mind simplicity, there is plenty to like. The bottom line is that for the right buyer, the Williams Allegro 2 will be a great purchase.